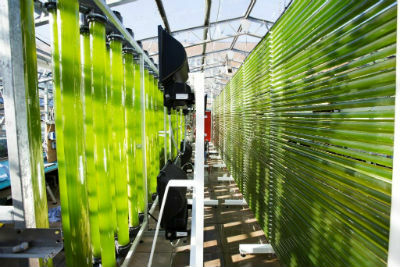 Algae are being used to develop new technology to clean up waste. Scientists at Swansea University are leading on a €5.5 Million eco-innovative project. The ALG-AD project could potentially result in a circular economy solution whereby excess waste nutrients produced from anaerobic digestion of food and farm waste are used to cultivate algal biomass for animal feed and other products of value. ALG-AD is a project from Interreg North-West Europe (NWE) a European Territorial Cooperation Programme funded by the European Commission. The project is being led by Dr Carole Llewellyn, Associate Professor in Applied Aquatic Bioscience at Swansea University. Dr Llewellyn explained: “The project stemmed from issues surrounding Anaerobic Digestion (AD). AD is used to process a significant amount of food and farm waste to produce biogas and a nutrient rich digest. With expansion of the AD industry across Europe there is excess nutrient waste. EU legislation and the introduction of nutrient-vulnerable zones across Europe to prevent nutrient run off causing pollution means that solutions need to be developed. The ALG-AD project will combine algal and anaerobic digestion technologies. Algae require nutrients to grow and so the excess nutrients from AD of food and farm waste provide an essentially free, otherwise waste source of nutrients. The algae can then be processed to produce commodity products; so for example in this project we will be looking to use the cultivated algae biomass in animal feeds. ALG-AD has been funded for 3.5 years. Swansea University is leading the project in collaboration with ten partners comprising university, industry and policy makers across the UK, France, Germany and Belgium. Swansea University is to receive over €1 million from the European Union matched with €700,000 from the Welsh Government. Images: (top): Algal Cultivation facility at Swansea University; (bottom): Anaerobic Digestion Facility based in Devon at Langage AD.